Providing up to the minute city information 24 hours a day for the City of St. Petersburg Fl. Response to our survey showed overwhelming response in favor of changing our format to NEWS style. This new NEWS show will be titled "CITY JOURNAL" and will be produced weekly, keeping information fresh and topical. Please tune in with us as we welcome our anchor Julie Hall in this new show format. The City of St. Petersburg recently acquired a low power UHF Television transmitter to carry its 24 hour City Information Channel. The station covers all public City Meetings from gavel to gavel, unedited and uncensored. Also provided are shows produced internally dealing with various City related topics of interest. W35AJ was recently featured in "GVM", "Government Video Magazine", a national publication that features television and video technology. The article can be found in the October 23, 1995 issue of "GVM". 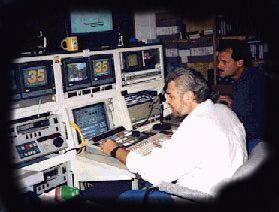 W35AJ produces 650 hours of original programming each year with a staff of one part time and four full time employees. W35AJ transmits with an effective radiated power of 8,750 watts and covers all of St. Petersburg as well as Clear water to the north and well into the west side of Tampa. Council Chambers: 2 Sony DCX 325 cameras, 2 TSM HSP105 remote heads, 1 Sony 1040Q 3 Gun projection television. 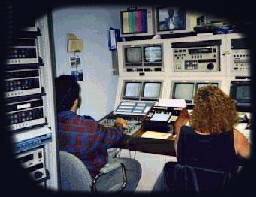 Post Production: Amiga 2500/NewTek Video Toaster 3.0, Sony 3/4" VO-9800, VO-9850, VO-9600, 4 Sony monitors, Clearcom audio monitors, and a Yamaha 1204-2 12x4 audio console. ENG/EFP: Sony DXC-325 & 327A cameras, Panasonic AG7450 SVHS deck docked to a Sony DCX-327A camera head, Sony VO-8800 3/4" docked to a DCX-325 camera, Panasonic AG-D800 "Supercam", Anton Bauer charging systems, Lectrosonics wireless mics. EV RE20, Sennheiser shotgun, Shure, and Sony ECM mics. To find specific keywords look at the top button bar of your Web Browser and click "Find" or "Search" type in a word, i.e. "council" and click "Find" or "Find Next". If you are at the bottom of the page activate "Search Up" or in the middle of the page either "Up" or "Down" to find the text you've typed.